Indonesia-South Korea Cultural camp is a 4 weeks cultural activity offered by Universitas Muhammadiyah Yogyakarta. Indonesia- South Korea Cultural Camp is a cultural learning program designed to be a platform of cultural exchange between Indonesia and Korea, to give an understanding on culture and social awareness for participants from both countries. On this program, participants will learn about culture from Indonesia and Korea while also making an international network of friendship. The participants of Indonesia-South Korea Cultural camp were 18 students and 3 coordinator from Sun Moon University, South Korea. This program combines Indonesian language training with daily activities and cultural excursions to enhance the Indonesian experience to the participants. During the 4 weeks at the world’s largest archipelagic state, the participants’ schedules will be filled with a variety of exciting activities such as visiting Batik Rara Djonggrang for learn batik canting, learning traditional dancing, learning to make traditional food like tempe dele, learning how to membatik wood mask, visiting Merapi and for lava tour, visiting Malioboro for shopping and Prambanan tour. In addition , all of them will be provided by UMY several classes teaching about Indonesia and Local language, English Class, Introduction to Indonesian Governmental Administration, Introduction to Indonesia Political system, Introduction to Indonesia Economic System, Introduction Economic Management and last but not least Introduction to Muhammadiyah Study. This wide variety of activities were organized to build up teamwork, gain cultural insight, and most of all, challenge students to break out of their comfort zones. “Those attending Indonesia-South Korea Cultural camp can learn about Indonesian culture through theory and practice. This will allow participants to have comprehensive understanding about our culture, along with studying language. I hope all of you will enjoying one month trip in special region of Yogyakarta especially UMY ” said the Vice Rector V; Prof Dr. Achmad Nurmandi, M.Sc. 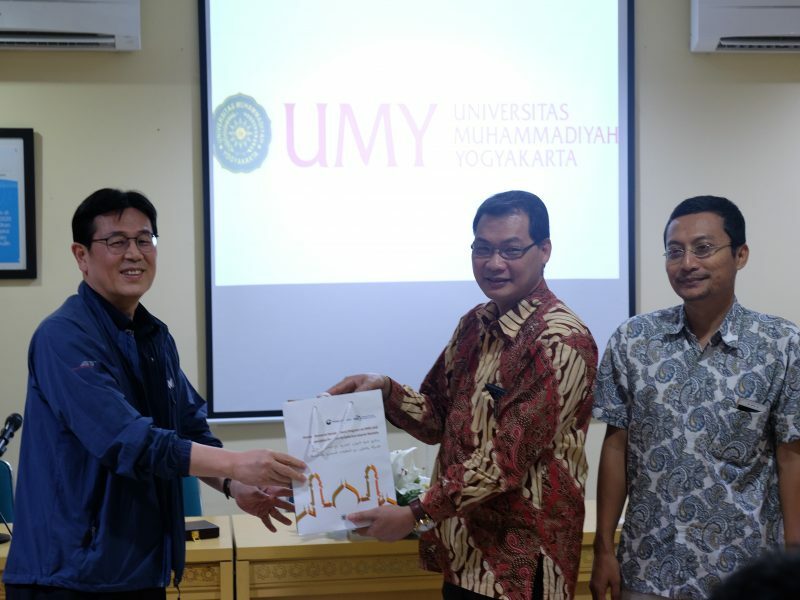 A representatives from Sun Moon University , Dr .Tae Hoi Huh said “Through the camp, i believed UMY will spread the knowledge not only through language, but culture as well. Thank you for all your hard work and efforts to prepare this one month cultural camp, we really appreciated. One again we extend our sincere thanks and acknowledgements to all those buddies and organizer . Kamsahamida” he closed.